We interrupt this regularly scheduled Chicken Blog to bring you information on my upcoming trip to Peru and Ecuador. I leave 2 weeks from today (YIKES!). Does anyone know where my passport is??? We have signed up for a 21 day trip with G-Adventures. This is a “budget” Adventure Travel company out of Australia and is also the company I used when I traveled to Kenya and Zanzibar in 2007. They were great! Very small groups, professional and knowledgeable guides/cooks/support staff, with an emphasis on mixing with the locals as much as possible. 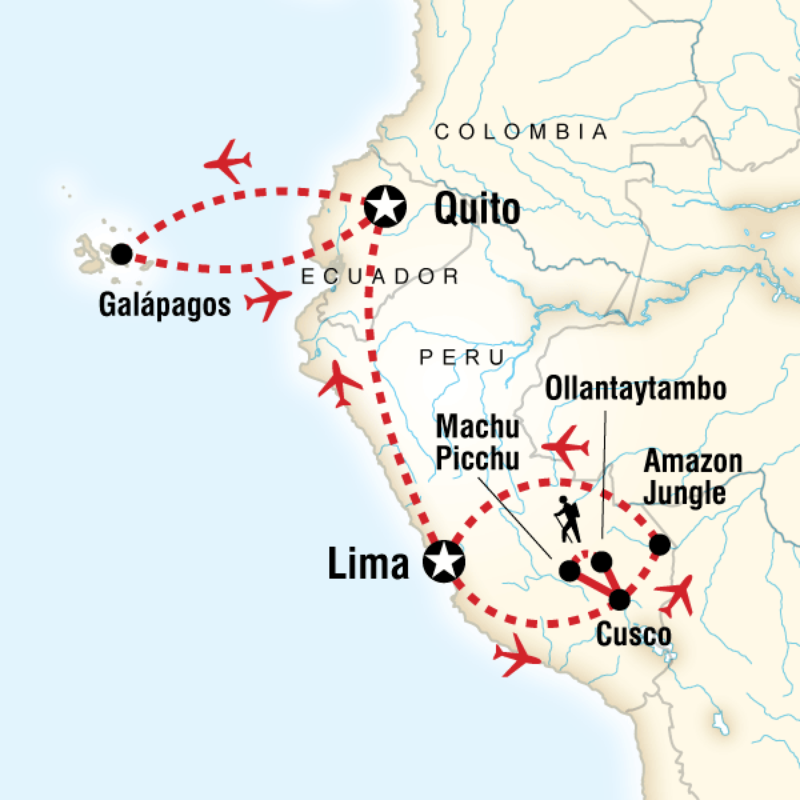 My friend and I will fly into Lima 2 days early and I will stay in Quito 1-2 days after the trip ends. Coleen will be staying in Ecuador for an additional 8 days or so; other than those extra days, our time will be spent following the Itinerary shown below. Enjoy a full-day guided tour of the Sacred Valley. Stop at the Planeterra-supported women’s weaving co-op before exploring the Pisac ruins. Break for lunch at the Planeterra-supported Parwa community restaurant in Huchuy Qosco. Finish the day exploring the Ollantaytambo ruins with a local guide. At 3,650m (11,972 ft), reach the ruins of Phuyupatamarca, the “Town Above the Clouds.” Camp here or go 1.5 hrs further along, near the Wiñay Wayna ruins (Forever Young) located at 2,650m (8,694 ft). Catch the bus to Aguas Calientes to meet the CEO and any non-hiking members of your group. Eat and relax before your train back to Cusco in the afternoon. Enjoy guided excursions led by expert naturalists to spot wildlife at nearby oxbow lakes and clay licks. Spend some time relaxing in a hammock, enjoying the local swimming hole, or visiting a nearby plantation. Go on a caiman-spotting cruise after dinner. Fly to San Cristóbal Island. Meet the guide and transfer to the boat. Visit Isla Lobos in the afternoon. Land at Punta Cormorant on Floreana Island. Guided walks to observe the bird and wildlife and learn about the natural history. Visit Post Office Bay in the afternoon. Snorkelling excusion at the Corona del Diablo. If you’d like to take a closer look at the boat we will be on in the Galapagos, you can click below. Get an up-close look at your Galápagos ship, the comfy 16-passenger Xavier III. Alan AND Suzanne are coming over tomorrow morning to help with the Coop and to help place the Roof on the Run, so stay tuned for a Chicken update soon. 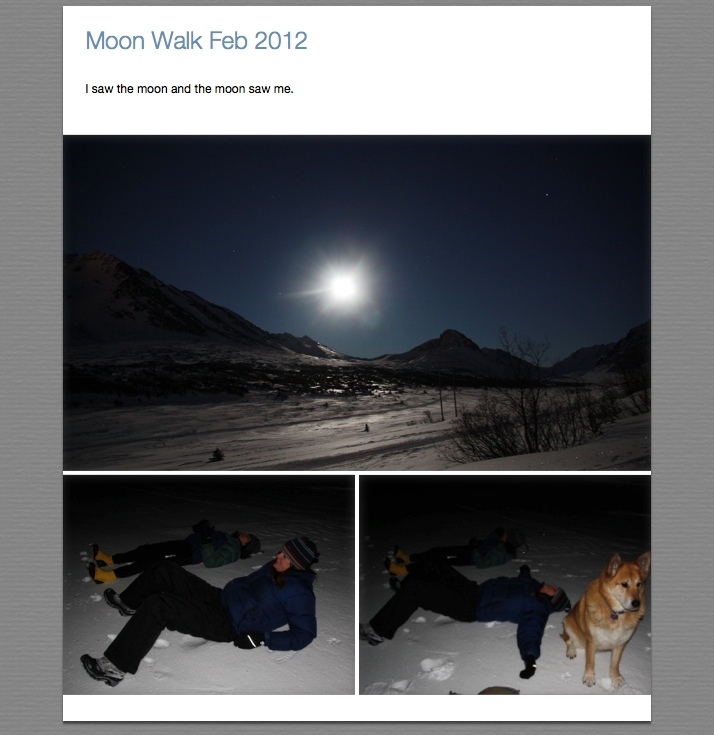 The moon was full last night and here in Anchorage, it was clear with balmy 21 degree temps up in the mountains. A few friends and I decided to head up to Powerline Pass for a stroll in an effort to better appreciate the moon and the mountains in all their moonlit glory. Photos by Devin. Look how bright it is with all the wind polished snow reflecting the abundant light. Wish you could have seen it! Geocaching with Devin was on the docket for today-down to Portage, about 45 minutes South of Anchorage at the end of the Turnagain Arm and just before the tunnel leading to Whittier. Turns out rain was forecast down that way, so we opted for Eagle River instead since light snow and all things lovely were the order of the day over there. Off we went and after the 45 minute drive North, we arrived in the rain and blowing wind. No worries, this is what we do, so off we set down the trail in search of some caches. Well, the further we got the harder it rained and the stronger the wind became. There were a few times the wind blew so hard, we ducked for cover just in case a tree was headed our way. Here’s a shot of Devin protecting her eyes from the sideways blowing rain and snow. Too bad the sideways blowing rain and snow isn’t visible in the picture so you could better appreciate how nasty the weather actually was. Did I mention the rain and snow was blowing sideways? After a couple of hours of this ridiculousness, we decided to head on back to the Nature Center for some hot chocolate by the fire. Lovely. 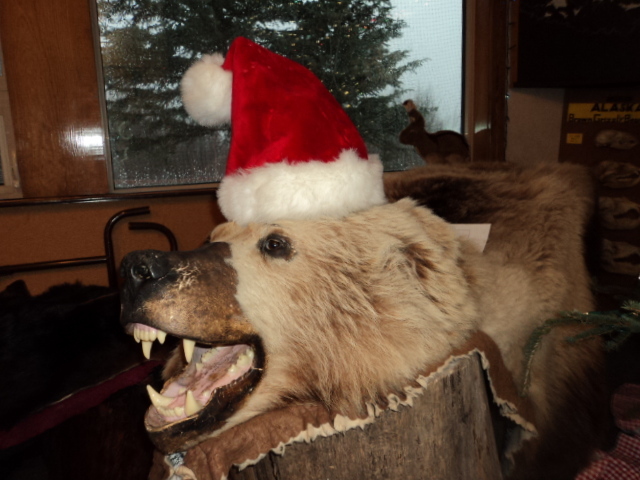 And look how nicely they decorated for the Holidays. 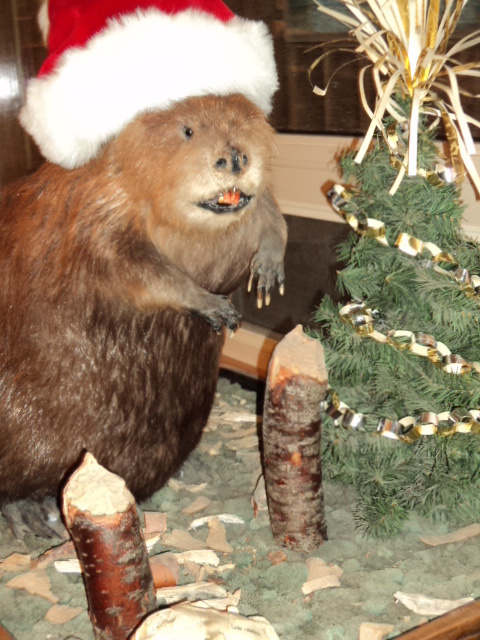 The Holiday Beaver and the Holiday Grizzly Bear. How festive! 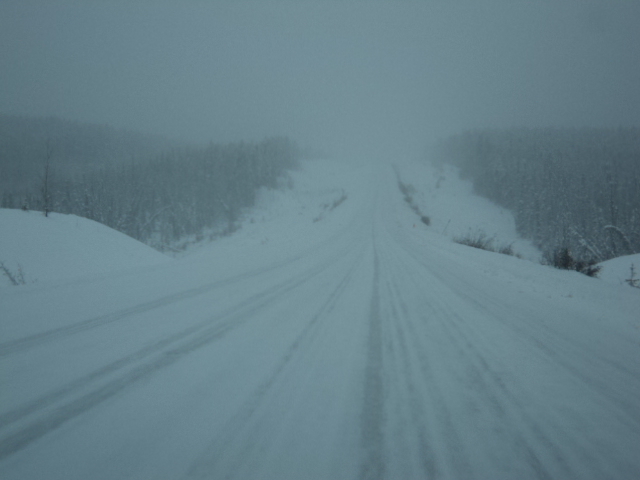 After our hot chocolate, we headed back to Anchorage and arrived in a full on blizzard…not really, just some very heavy snow fall. 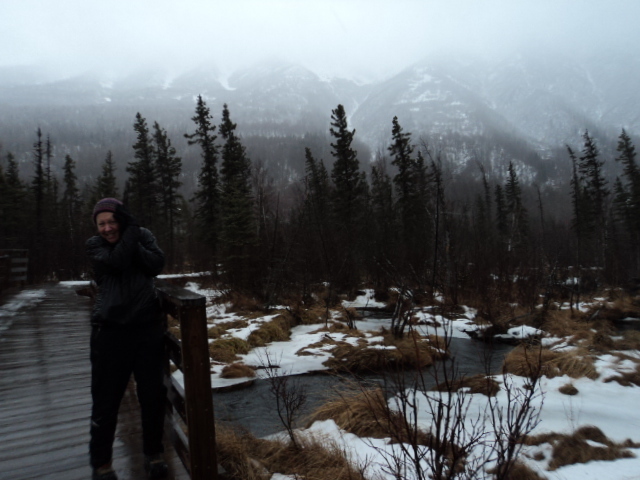 You do remember that we left Anchorage to avoid the rain and went to Eagle River to find the snow, right? Too funny that we ended up in the rain and came back to big time snow. 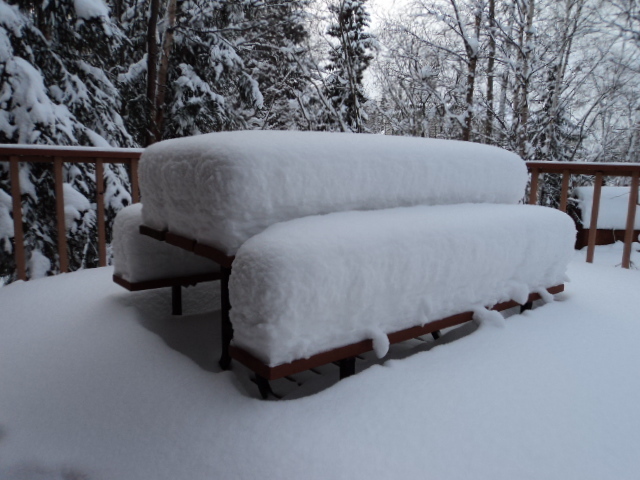 6″ in just a few short hours. Lovely. Devin and I laughed as we saw bicycle riders, joggers, walkers, and people in general going about their day seemingly oblivious to the serious snow fall and how down South, all the bread and milk would be sold out at the stores and everyone would be hunkered down inside their cozy homes wondering how they would be getting to work in the morning. 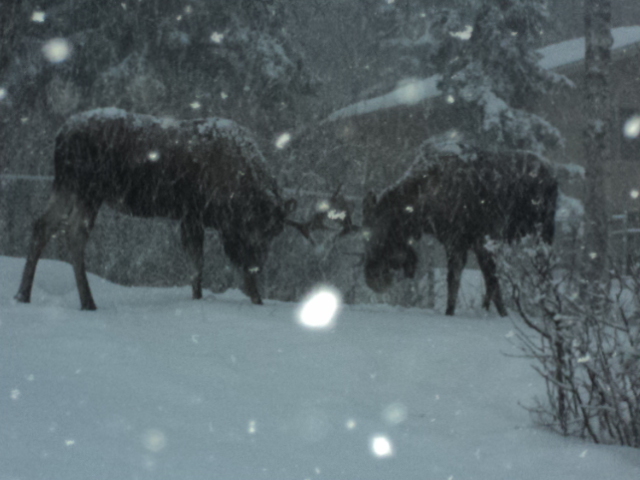 After dropping Devin off at her house, I stumbled across these two bull moose playing with each other in someone’s front yard. Look at ’em havin’ fun. 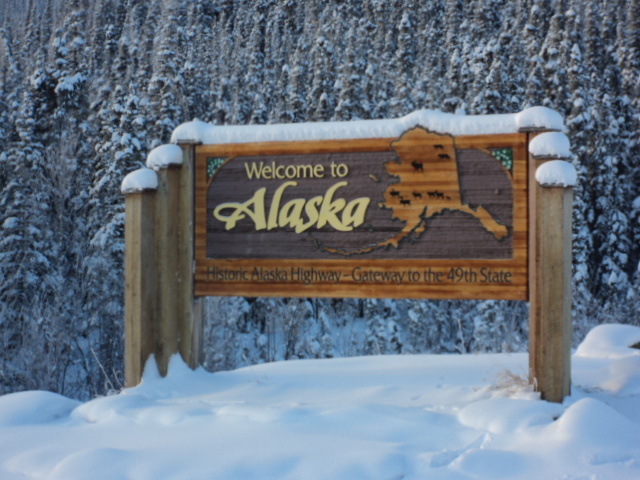 After a gorgeous drive on mostly familiar ground, I arrived Anchorage at about 4pm yesterday afternoon, unloaded and returned the UHaul without incident and set about contacting friends and getting settled. I made note of several things on this, my first full day back. Sunrise was somewhere in the neighborhood of 9:30am. It’s on the plus side of zero, temperature-wise, but less than 20. Snow is heavy. I shoveled much of the deck and stairs, but left the picnic table as I found it. Take a look. Groceries are ungodly expensive…I had forgotten…and gas is almost $5.00 a gallon for Regular Unleaded. 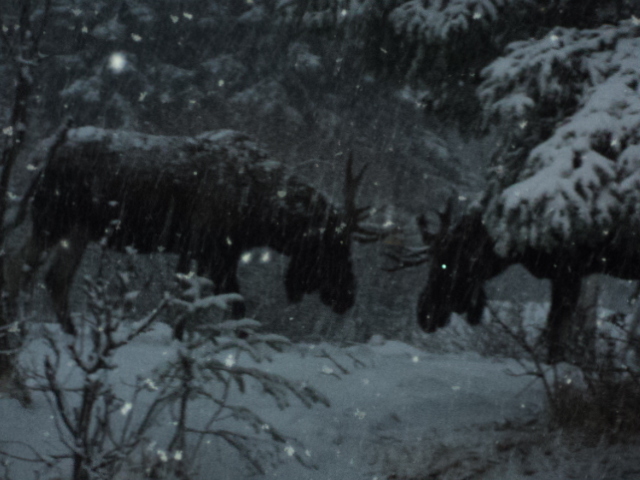 I had also forgotten to watch for moose. You can’t swing a cat around here in the winter-time without hitting one. 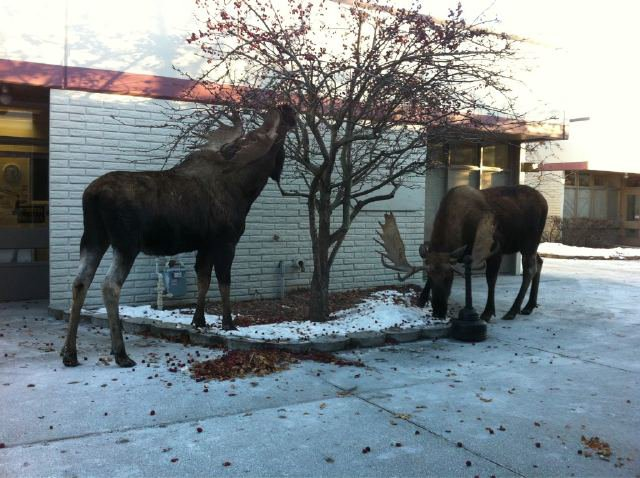 I took the dogs for a walk around the block this afternoon and happened to glance left and saw a bull moose about 30 feet away grazing on the neighbors bushes. Good thing the dogs didn’t see him. It’s funny because for as large as they are, sometimes they are quite easy to miss. I went back with my camera, but he had already moved on. Two more walked through the yard a few hours later, but by then, it was already dark, so the picture didn’t turn out. Here is a shot my friend, Devin, took outside of the AT&T office in mid-town. Mosely and I are happy as clams to be here and Misty will be as soon as the antibiotics kick in I had to get for her bladder infection. Poor thing. Tomorrow its geocaching and Thursday its skiing. 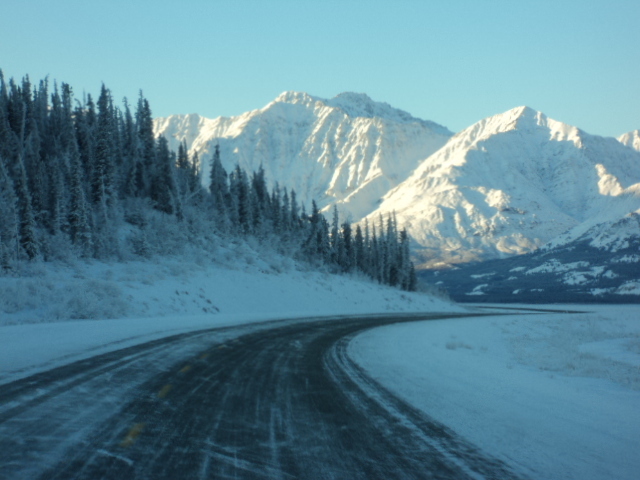 The Alaska Highway aka The Alcan is considered one of the top 10 construction feats of the 20th century. A tad bit of history. 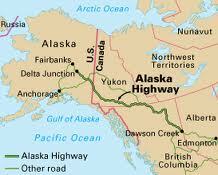 Since the 1930’s there had been discussions about building a road linking the Western United States to Alaska. There had not been a strong push until the Japanese attacked Pearl Harbor in late 1941. It was then that the leaders in Washington realized we needed a supply route to the small, but strategic forces located in Alaska. The Army Corps of Engineers completed the 1,390 mile highway in 1942. I’d say I’ve covered some ground since last I posted since I’m in Tok, Alaska now, which is not too far from the end of the Alcan. From here I cut south and west about 340 miles to Anchorage where I will happily hang my hat tomorrow afternoon. Misty, Mosely, and I will be relieved to be out of the car for an extended period of time since driving for 7-9 hours a day often on ice can be somewhat stressful. I realized while I was staying the night with my first and fabulous Couch Surfing family(just a quick aside to say Couch Surfing is really quite amazingly wonderful), that the weather forecast was good for the next several days, so I thought I’d take advantage of it and see how far I could get. I took my conservative schedule and threw it out the window and just started driving. Turns out, other than one day of light snow, the weather and roads have been quite good, so here I am, almost at the end of the trip. 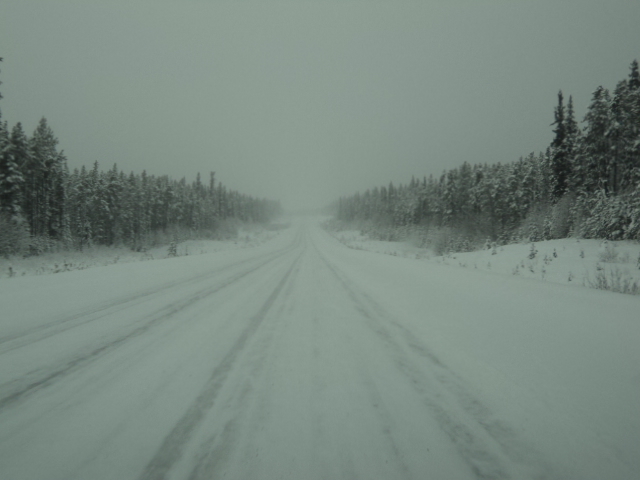 You should understand when I say the roads have been good, this is a relative statement as you’ll see in the following photos. What it means in this case, I think, is that the roads were not covered with several feet of snow. I jumped on the Alcan at Mile Zero, Dawson Creek, and am jumping off it tomorrow here in Tok, just east of Delta Junction. I was in the car anywhere from 7-9 hours a day and stayed in motels when I wasn’t with the wonderful Couch Surfing hosts in Dawson Creek and Watson Lake. Fortunately I have needed none of my “survival gear” thus far and am crossing my fingers this will still be the case when I arrive Anchorage tomorrow afternoon. The temps were quite civilized (above freezing) except for in the Fort Nelson area and most of today where it dipped down to minus 30 at its coldest. Brrrrrr. I guess the best part of the trip, other than the fact that it’s been a safe one, is all the wildlife I saw. 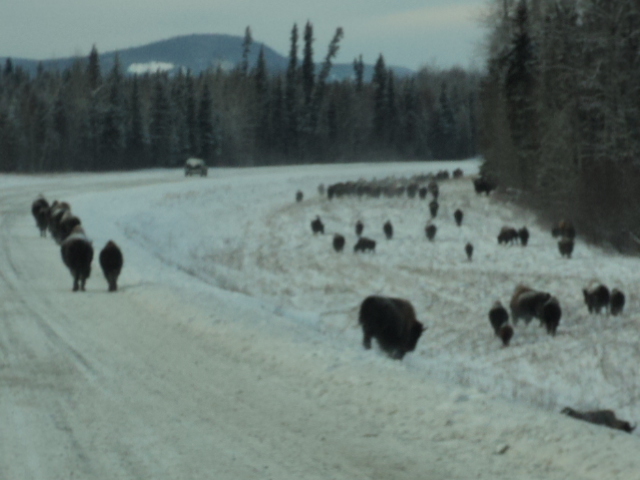 Unfortunately I did not get photos since it was inappropriate/unsafe to stop for them, so other than the buffalo, you’ll have to use your imagination. Here’s what I saw: a moose, a pair of Elk ewes, a deer, a small herd of caribou, a rather large herd of buffalo, a lone wolf, a red fox, a mink (or at least I think that’s what it was), a snowshoe hare who wasn’t yet fully white, but almost, a family of grey fox, more elk, more caribou, another deer, and a polar bear. 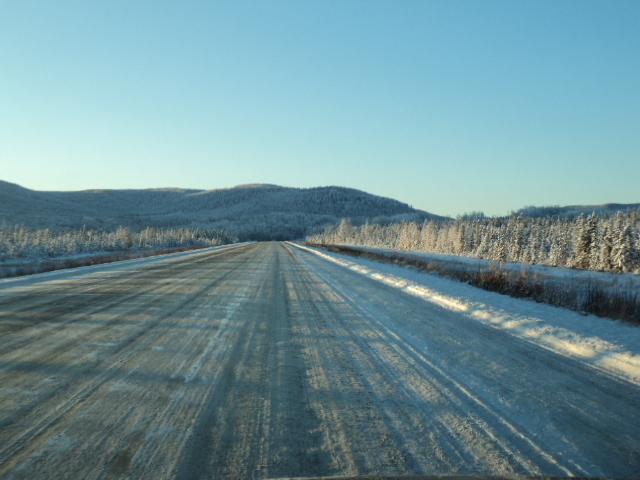 I’ve got some photos below I took along the way to give you an idea of the road and the scenery. Just imagine looking at this for over 1,200 hundred miles with very, very few other travelers. Here’s what it looked like on the sunny days. 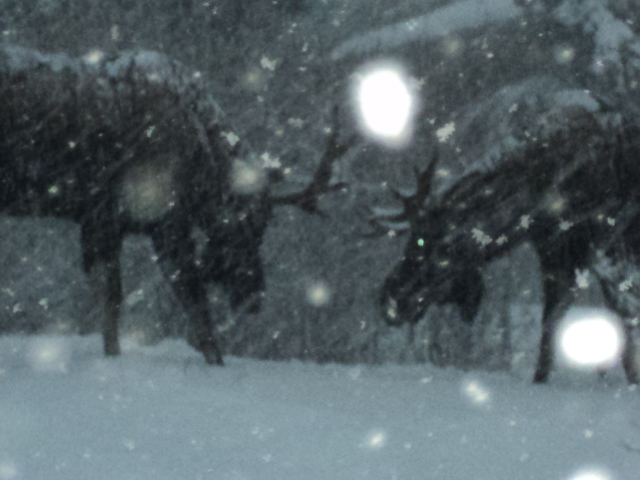 This one I took today not too far east of Alaska and I think pretty much sums up why I came home. And here’s what it looks like on the not so sunny days. And finally, a most welcome sight. “Welcome to Alberta”, the cheerful sign said once I had crossed over into Canada. After a most uneventful border crossing, where once again no one asked me for Misty and Mosely’s Required Health Certificate which I had just spent $100 and 2 hours procuring, I proceeded north along Highway 15 as it sliced its way through what looked like The Great Plains, minus the buffalo. Open, low rolling, hay colored, country as far as the eye could see, dotted with the occasional silo, haystack, or farmhouse. 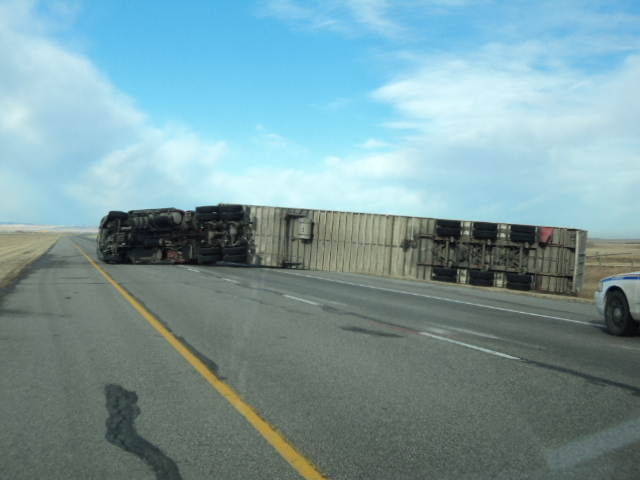 As I drove I noticed the crosswinds picking up and by the time I got up to the Lethbridge area, they had gotten rather alarming. I slowed my pace accordingly, gripped the wheel a bit harder, and looked around nervously as I watched tumbleweed after tumbleweed do more of a shoot across my bow than a tumble across my path. It occurred to me that the UHaul was acting as a sail behind me and I hoped it wasn’t going to throw me over and down like one of those cowboys do the calves. (I’m still in cowboy country, don’t ya know). Well it wasn’t long before I had to slow down to a crawl due to flashing lights indicating an obstruction in the road. As you can see, the wind was indeed on the strong side. And within a few short miles, there was another. And within a few more short miles, there was another. Seriously. I kid you not. I mean, I don’t want to sound like I think I know what I’m talking about or anything, but wouldn’t you think these drivers would slow down after seeing one(or more) of their fellow truckers lying on their side next to the road??? And there you were thinking, how strong could the winds have been? As I proceeded north, I passed 2 more big rigs on their sides along with one pick up truck and its large 5th wheel trailer. Goodness, I hope all those drivers are alright. I was running out of gas, so had to stop. I faced The Black Hole into the wind and tried to get out of the car. It was quite tough since the wind kept slamming the door shut., so I ended up having to crawl into the back with the dogs and go out the hatch. Goodness. Once around to the gas tank side of the car, I was pelted with dirt, sand, grit, and flying trash, but I was lucky because I actually got some gas before the station’s lights went out rendering the pumps useless. Lucky me. I went inside to use the potty in the dark and chatted with the folks gathered there (not in the potty, but in the store) and learned the winds had been clocked gusting over 110km per hour. I don’t know what that is in American speak, but it must be some kinda humdinger. After struggling back to the car, covering my head all the while because I would have been knocked senseless if something heavier than trash happened to be flying by, I got in and headed north telling the hound dogs it wasn’t safe for them to venture out at this point and to please just cross their legs. A few hours later, I decided it was safe enough to let the dogs out for a much needed potty break, but have to say, we still struggled and had to lean into the wind to keep from getting knocked back or over. 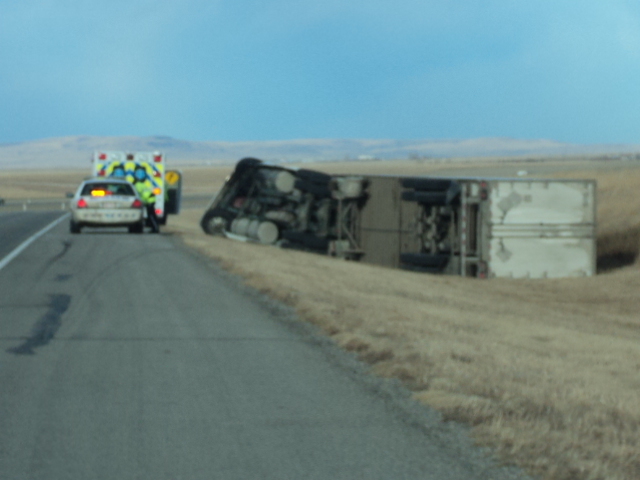 Later, I saw a man whose tractor-trailer had blown over and he was trying to get back to it. 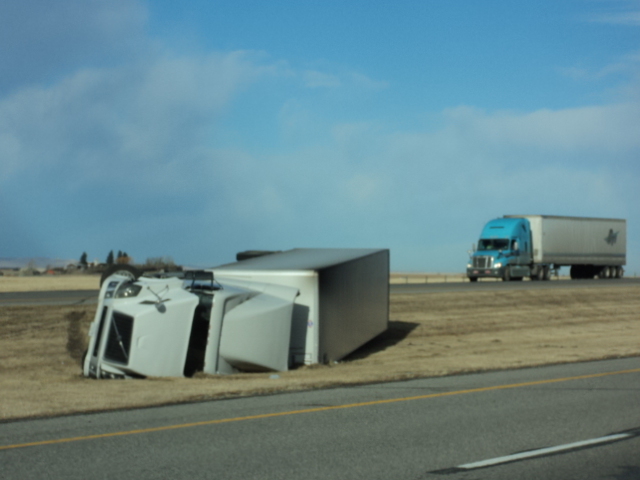 He was leaning double into the wind like in the cartoons got knocked down and back twice in the few seconds I watched. Goodness gracious. Welcome to Alberta indeed. Here I am in Shelby, Montana after 3 days of driving North through Northern Arizona, Utah, Idaho, and Montana. So far, so good I’m pleased to report…well, except for the two engine lights that came on before I even got out of Arizona. There I was, minding my own business, when I happened to glance down at the dashboard and saw not one, but two engine lights shining brightly…one of which was blinking at me most insistently. As soon as I had the chance, I pulled over, fished out the Owner’s Manual, and proceeded to research the problem. I found that one light signaled a problem with the exhaust mixture…?? ?….big deal…but the other, well, that one gave me pause. This second light, the one flashing so insistently, seemed to indicate a failure in my 4WD system. ^@#$%*!!! I don’t know about you, but I am of the mind that having an operational 4WD system might come in handy while crossing the Far North Tundra/Arctic/Yukon in the winter. I was in the middle of rural America, so there was nothing I could do until I could find someone who could help decipher the computer generated code/4WD system on my very foreign Hyundai automobile. Did I mention the Owner’s Manual had a “Caution Box” next to this indicator saying something along the lines of…”if this indicator light is flashing on a continuous basis, use extreme caution and seek the assistance of your dealer AS SOON AS POSSIBLE. The “as soon as possible” verbiage was helpfully in bold print. Well, I was basically in the middle of nowhere (not the kind of middle of nowhere like I’m going to be in a week or so, but the regular kind of middle of nowhere most folks are used to), so there wasn’t much to do at that point, but once at the hotel, I Googled the closest Hyundai service center and found that it was in Great Falls, MT, which at that time, was 3 states and 2 days away. Learning this, I Googled for a more local foreign car repair and could only find “American Car” car repair. Given the fact that I was in rural America at the time, I was not surprised. Anyway, to make a long story short, I drove the 2 days through icy rain and snow (of course) and arrived at the Hyundai Dealership in Great Falls earlier today. They could not have been kinder, more helpful, or even more efficient. I was in and out of there in less than an hour and a half and learned that my 4WD system is and was just fine. It seems the problem was with the sensor (basically a computer communications glitch and not a systems glitch), which they reset for me. All of this, including unhooking and rehooking the UHaul trailer, adjusting the pressure in my tires, and a delicious hot cup of coffee cost me less than $70. Who believes it? If any of you find yourself in Great Falls, MT and are in need of Hyundai repair or a new car, please stop in at Bennett Imports and ask for Frank. I recommend them highly! I’m less than an hour from the border, so with some more luck tomorrow, I’ll find myself sailing along up through Calgary to Red Deer where I will be welcomed by my first ever Couch Surfing Hosts, so stay tuned.